Today we’re happy to announce an exciting new way to build web and mobile apps with Angular and NativeScript. Before you can start code sharing, we need to know how to separate the web code from the mobile code. This is important, so that we could easily create platform-specific code without creating conflicts. To do that we can use a simple naming convention. By adding a .tns before the file extension, you can indicate that this file is NativeScript-specific, while the same file without the .tns extension is marked as web-specific. If we have just one file without the .tns extension, then this makes it a shared file. It is also worth noting that in your @Component Decorator the templateUrl and styleUrls point to files without including the .tns extension, as this is handled by the build process. Code separation is useful when working with NgModules, as often you need to import web- or NativeScript-specific modules. A very good example is when you need to make an HTTP call. In a web app you need to import the HttpClientModule, which provides you with the implementation for the HttpClient. However, the way http calls are executed in a browser is different to how they work in iOS and Android. In NativeScript you should use the NativeScriptHttpClientModule, which provides us with the equivalent implementation for the HttpClient. 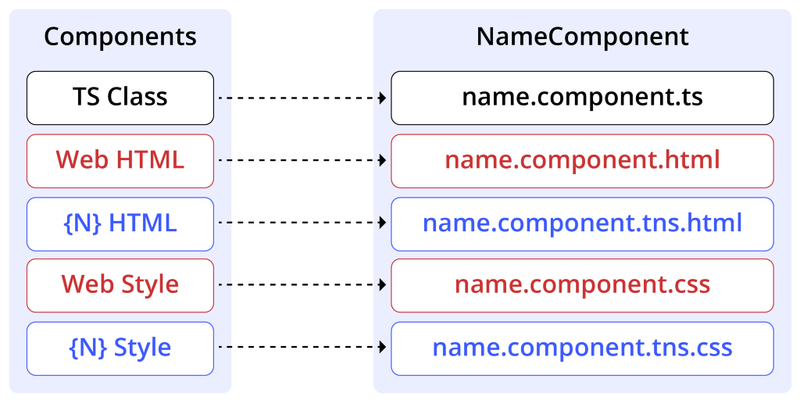 Now, you can use the code separation technique to create two versions of the @NgModule — each using a different version of the HttpClientModule — and then with the help of Dependency Injection provide the right implementation of the HttpClient into your service. Code separation for modules makes up for a simple and a quite elegant solution. It enables you to bring in functionality that has different implementation (for the web and mobile apps) under one hood and as a result maximise the shared code. Well then check out our sample project pet-bros-lite, which shows all these code-sharing concepts in action! As you can see, building for both the web and mobile from a single project is fairly straightforward. You can either start with a fresh project (using ng new), or add mobile to an existing project (using ng add). There is also a simple naming convention to enable code separation, which allows you to cover many scenarios. Go ahead and give code sharing a try, as it really is that simple. You are one simple ng add or ng new way from the wonders of code sharing in Angular. We would love to hear from you, let us know what works for you, what doesn’t, and how things could be improved. Any constructive feedback is always welcome. Please, send feedback here. 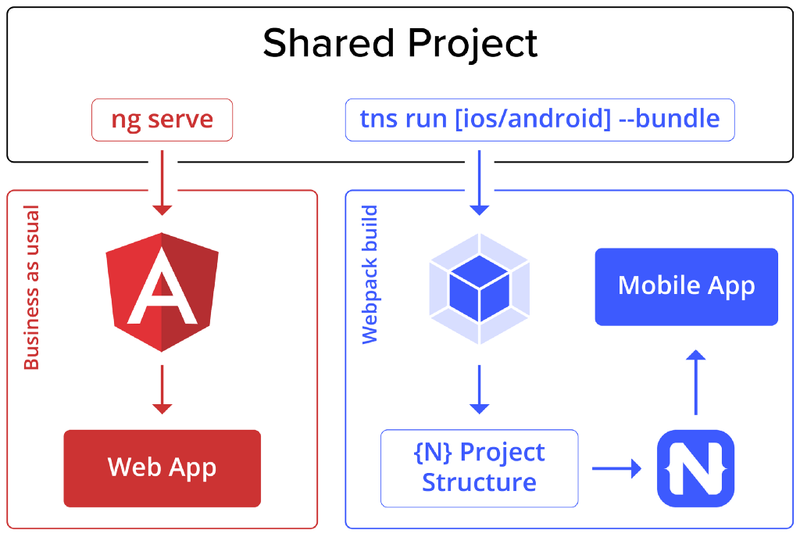 To learn more, see our documentation at docs.nativescript.org/angular/code-sharing/intro.